Ask fellow campers about "Willow Lake RV Resort" and nearby attractions. A nice clean facility with concrete pads and roads. Easy to maneuver motorhome. Has a huge lake where you can fish and kayak. We had lots of room to walk the dogs with a decent amount of grass around the lake. You will hear a little road noise from the road next door but did not bother us to much. The location is good with anything you want nearby. We did not use the pool or amenities but they appear to be very nice. The ground keepers do a excellent job, this is a nice facility. I caught a huge Bass in the lake, its catch and release. We camped at Willow Lake RV Resort in a Motorhome. A huge HEB is down the street, Dining, starbucks, shopping all very close. I have lived here for a year this September, I have to say how refreshing it is to see new management!!!! The new manager goes above and beyond to ensure that you are enjoying your stay. There are rules at every park and because of these rules is why Willow Lake is my favorite. It's clean, quiet and safe. Both the manager and the new maintenance man, keep the park well maintained and everything in working order. This park has great amenities. All concrete sites, pool, wifi, cable, laundry, bbq pits, pet grooming station, showers, community room, dog walking areas and even a media room. You can fish (catch and release), kayak, pedal boat on the lake. Would highly recommend!!! Don't let the negative reviews discourage you. This is the best park on this side of Houston!! We camped at Willow Lake RV Resort in a Fifth Wheel. Very disappointed. We stayed here 2 nights and could not wait to leave. We were provided one of the "pull-through" sites at the back. Getting in to our site required navigating through a maze of closely packed pickup-trucks and SUVs from the mostly full-time working residents. The park design gives the impression the owners are intent on maximizing the most possible number of RV spots in the least amount of space. These sites were almost less than the width of my trailer apart. My window awnings and the awning of the Class A next door almost touched. Since we had a pet, I was concerned about the "Gator in lake" signs we saw posted. We also got frequent road noise from the overpass next door to the park, as well as the rumbling sound of Diesel trucks from workers departing at 5AM. I would not call this a "Resort" by any stretch, notwithstanding the postage stamp size pool. We camped at Willow Lake RV Resort in a Travel Trailer. The online reservation system did not work (not operator error) office staff confirmed, and they didn't answer the phone (during business hours). This park is full of long-term residents and probably has 10 slots available for short-term stays. We camped at Willow Lake RV Resort in a Travel Trailer. This is a fairly new park but the sites are narrow and they pack you in like sardines. There isn't adequate vehicle parking. The one dumpster overflows on the weekends. The laundry room is small 6 washers and dryers at $2.00 each and at least one washer is always out of order. The manager is constantly sending out threatening emails but never does anything. The park rules aren't enforced. The internet is slow, the dish network always has one or two channels not working. Management doesn't check it. It is listed as an adult park with kids being able to visit. But kids live there full time. Also say they don't allow aggressive dog breeds but they do. They site we were in was $650.00 every 28 days. With where the sewer connections and slides are, be prepared to have your neighbor on top of you. When the park is full it's hard to get washers. Don't give management your email because you will constantly receive the threatening email blast she sends out to the entire park. Empty your trash during the week because there is no room on the weekends. We camped at Willow Lake RV Resort in a Fifth Wheel. We stayed for 2 weeks and the price reflects the weekly rate. The park sets back off the road about a block or so, and while the GPS had no problem finding the address, we missed the sign on our first pass. We had to turn around, and we found their small sign on the second try. When we checked in, I told them about missing their sign the first time, and they said that was the largest sign that they could have. We had reservations for a back in site, but after seeing how close they were, we requested a pull thru, which was a little better, but still quite close. The people were friendly and helpful. The park is kept clean and the facilities that we used, the gym and the community room, looked clean. The sites were all concrete, with the back in sites really close together. The pull-thru sites have a little strip of grass between them and maybe enough room to open your awning. We didn't use our awning, so we don't know for sure. The hook-ups were easy to locate and easy to get connected. We noticed that where we were, most of the pull thrus had 2 sewer connections, one at the back of the site and one about the middle. The wi-fi worked very well, as did the cable and satellite TV. We had no problems with the water pressure or electricity. We camped at Willow Lake RV Resort in a Motorhome. We found that we enjoyed the Johnson Space Center more then we did the Kennedy Space Center. We used the Houston City Pass, which saved us some money. Galveston Island is about 30 minutes away. There is also a free ferry between Galveston Island and Bolivar Peninsula. We stay in the Houston area periodically to visit our son and grandchildren, and it's always a chore to find a decent RV park. This one is OK, but the sites were very close together and mostly concrete. There is a lake in the middle of the park but not for swimming. We did have a small grassy area by our site, but our neighbor's utilities were in the grass and so close to us they were under our awning. No picnic tables. The sites are mostly back-in with a few pull throughs. The cheaper ones are on the perimeter and the more expensive around the lake. They have good electric for both 30 amp and 50 amp, and good water pressure. All sites have sewer hookup. They do have WiFi (but we did not use it as I have my own Jetpack) and cable. The pool is on the small side but there were not many people in it. It's mostly an adult park with lots of full time workers. There is no playground or dog park, but they do allow dogs. There is a small theater and recreation center; a few bathrooms around the pool area, and a nice laundry area. The washing machines do not take quarters though. You have to buy coins to put in the machines, and they all cost $2 each - pretty expensive. We camped at Willow Lake RV Resort in a Travel Trailer. This is a newer campground with nice new sites and amenities. The campground surrounds a beautiful fishing lake. The sites are fairly close together and offer no shade or privacy. No picnic tables. Poor wifi. Big rig friendly. Price reflects weekly rate. Given the tightness of the sites the daily rates seem pretty high ($50.00). Location is great for touring Galveston and the Space Center. We will stay here again in our motorhome if we plan on being away from the park most of the time. We camped at Willow Lake RV Resort in a Motorhome. Nice concrete sites,some sections are spacious but many like ours are very tight. We could not extend our awning all the way. Also inadequate space for vehicles. Just poor planning on the set-up. This is supposed to be an adult-only park. The managers say that kids "just visit" grandparents, etc, but children DO live here, full-time. The managers do NOT enforce the rules that are meant for everyone, this one being the most blatant. Also, speeding is not controlled or dealt with. Worst we've seen. A few speed bumps were installed but they are totally ineffective. This is a beautiful park on a nice lake with willow trees bending over the water, nice amenities, but if you're hoping to relax by the pool because you read it's an adult-only park, you will be disappointed. Kids come in and take over the pool. This also has become more of a worker camp than an RV resort. Most are quiet and respectful, but a few at times get rowdy. Rates have gone up, making it a poor value for the issues present. Too bad. With effective management and a bit of re-work on site design, it would be more worth the cost. We camped at Willow Lake RV Resort in a Motorhome. This is our second stay at this RV resort. First time was with two small dogs and our 6yr old. This time just our 6yr old, wife, and I. Very nice and clean. Not a lot of room between RV's but plenty enough for slides, vehicles, and a 6yr old to play. Great pool, the gym is really nice, and we have only had positive encounters with other tenants and employees. I highly recommend this rv park if you are staying in the area. We also have a sail boat here in Kemah and go back and forth with no worry about security. We camped at Willow Lake RV Resort in a Motorhome. This is a new park in League City that has just opened. We stayed here just one night. There is a beautiful body of water at the center and all the sites are located around 3 sides of it, with willow trees along a a fence that surrounds the water. There is a lot of concrete, the roads, the site pads, with a small area of grass in between. However, the spaces are somewhat cramped and there is almost no room for awning, patio rug, chairs on the grassy area without infringing on the connections of RV in the adjacent site. There are no picnic tables, grills, or fire rings at any of the sites but there are at some of the common areas (2 gazebos). 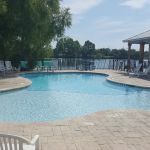 This is a nice place to stay and central to a lot of attractions north (Houston, NASA Space Center), south (Galveston), and east (Kemah Boardwalk) We camped at Willow Lake RV Resort in a Motorhome. Are you affiliated with Willow Lake RV Resort ?